Over 2,000 motorcycles will gather in San Blas, the first and only Biker Port in Mexico, where riders and attendees will enjoy contests, live music, exhibits and the chance to win two new motorcycles. 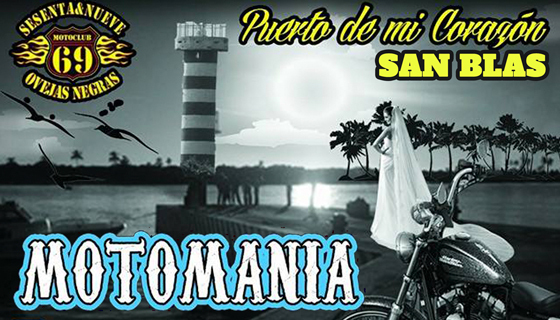 Everything’s ready for the VI Motomanía San Blas to blast off November 24-27, 2016, when motorcycles from 15 states around the country will gather in this Historic Port. The esplanade of the San Blas dock will host most of the activities including contests, live music and exhibits. The welcome event will take place on Thursday at 9 p.m. at the Billy Bo Karaoke Bar. Registration begins at noon on Friday morning followed by the official inauguration of the festival at 4 p.m. Afterwards, attendees will receive gifts on behalf of the sponsors and the first contest will take place. That evening everyone will enjoy some good rock music and a wind band. There will be additional time for registration on Saturday then the grand parade begins around 4 p.m., which includes a stop for a photo op from the top of La Contaduría. Once that’s over there will be a Biker Rodeo with cash prizes for the winners and in the afternoon an awards ceremony, surprise raffles and live music. Afterward, a late-night 80s Disco Party and a norteño banda music will close out the evening. On the last day, the attendees will head out after enjoying a complementary ceviche courtesy of Cobra Biker around 1 p.m. There will be over 2,000 bikes gathering at the one and only Biker Port in Mexico, most of them riding in from the states of Chihuahua, Nuevo León, Querétaro, Zacatecas, San Luis Potosí, Jalisco, Sonora, Michoacán, Colima and, of course, Nayarit, among others. As happens every year, the event is taking place thanks to the support of the Nayarit State Government, the San Blas Town Hall, the San Blas Hotel and Motel Association and the Riviera Nayarit Convention and Visitors Bureau, among other sponsors. For more details call 311 120 3655 or email bikersnayarit@hotmail.com. Visit: https://www.facebook.com/Motomania-SAN-BLAS-1465744890334658/?fref=ts.